That's what you get when you cross a need for skirts and knitting. I really do have girly, girls. Never thought I would, I was completely non-girly in the most definite way that I can remember. I spent my years playing competitive sports and my shins were donned with oodles of bruises. 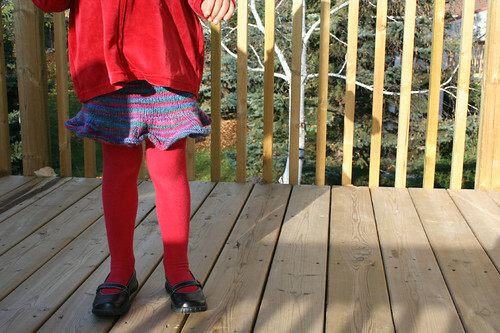 Perhaps a skirt or two were in my little girl past but I can't remember. I don't have a pattern for this one. I knit it in the round so there are no seams and then increased stitches substantially toward the end to make the ruffle. 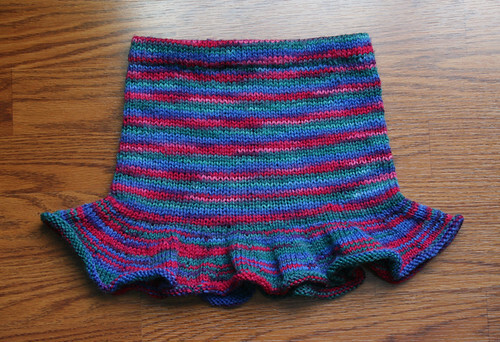 I was inspired by this leg warmer I was originally making way back when. As soon as I get the chance I will write up the pattern and perhaps even put it in a free pdf. download. One of the nice things about this pattern is you will be able to customize the length of the skirt depending on the size you need.